In Canada, rock formations targeted for fracking are about 1.5 to 4 kilometres below surface. The many layers of rock between the target formation and the land’s surface prevent frac fluids or hydrocarbons from migrating upward. Sound wellbore design and construction is also fundamental to protecting groundwater resources and to responsible oil and gas development. 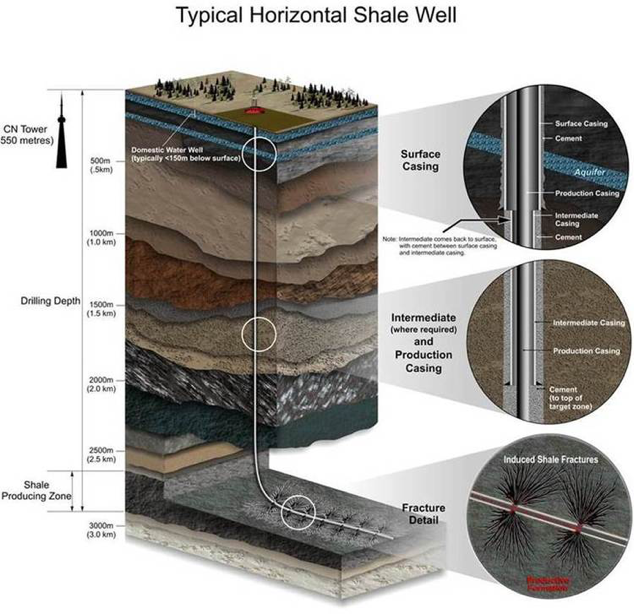 Wells are designed and constructed to ensure isolation between the inside and outside of the wellbore, including several layers of steel casing and cement used for surface and production casing. This isolates fresh water aquifers from the oil and natural gas zones or frac fluids. Surface casing is required to extend below the base of the freshwater aquifer to provide a double seal from any possible migration of fluids. Wells are pressure tested to ensure their integrity prior to the start of the fracking process. Spill prevention, response and cleanup procedures are implemented before drilling begins, and they are continually updated as operations progress. Surface and groundwater are protected by numerous guidelines, best practices and regulations in the drilling and fracturing processes. A national study by the U.S. Environmental Protection Agency found no evidence that fracking has led to widespread, systemic impacts on drinking water resources in the United States.